Thanks to everyone who contributed to our April Fundraising. It was a huge success and we can not thank you enough for your continued support! Thank you to Mariam Thompson for making this beautiful quilt, thank you to all those who sold and bought tickets and thank you to the Bank of NS for supporting FOPE in this important fundraiser! And thank you Scotia Bank for matching it! FOPE was very fortunate to host noted NS artist Tom Forrestall. Over two days,he met with a group of local artists to paint, mentor and share technique at various sites around the Pugwash River. Four beautiful watercolours illustrating the beauty and diversity of the Estuary were created by Tom Forrestall and three of them are available for sale by FOPE with proceeds going to support our various projects. Thanks to Betty and the FOPE Art Committee for coordinating the visit and preparing the paintings for sale. A dinner of appreciation was held at the golf course, and the FOPE community got a chance to meet and speak with Tom. Three of the Forestall paintings which were completed during his visit to Pugwash (see July 7th) have been hung by the chimney with care and are ready for viewing at the Northumberland Curling Club. Two of them are available for purchase - check it out with Betty Hodgson or Alice Power. Greeting cards and prints of the pictures are also available. A lot has been happening to the FOPE house. Renovations are under way, and we held our open house to show off where we are now. The draw has been made and the 2016 winners of teh Mariam Thompson quilt are Ray and Mary Jamison. 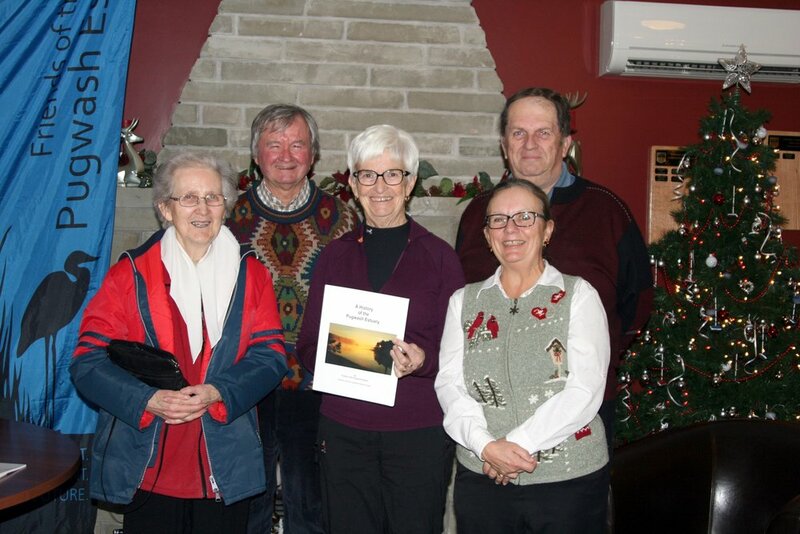 A History of the Pugwash Estuary, was launched in fine fashion. Those who were most responsible to bringing it to fruition came together to celebrate. Stephen Leahey had the idea and directed the process which included finding and hiring Skeena Lawson, the talented young historian from Mt. Allison. Terry Smith and Thelma Colbourne attended. They were two of the local experts whom Skeena interviewed - unfortunately Ralph Thomson and Howard Ferdinand were unable to attend. The Historical Society which provided office space and information for Skeena was represented by Wayne Arsenault and Thelma Colbourne. Editor Hazel Felderhof was there as was Production Director Theresa Rushton. This year's AGM focussed on reviewing the projects and work done this year. It was preceded by a snowshoe where members once again experienced our two beautiful trails. A draw was held for those who snowshoed, and the winner was Merlin Brown. He was awarded his prize, a copy of "Hiking Trails of Mainland Nova Scotia" by Sarah Witney, organizer of the hike. BIG THANKS TO SCOTIABANK FOR MATCHING IT. Our 3-pronged event this year was a success. The hikers had a lovely spring hike with Doug and Greg providing commentary. There were about 18 people on the trail. The kids had a lot of fun tearing around the trail finding the controls - and getting their treasure - hopefully this event will grow next year. We had about 6 kids participating. The open house itself was more of an open yard - it was such a gorgeous day, we all just had to sit outside and eat a hot dog - expertly prepared by chefs McDonald and Hunt. A big thanks from Betty for all who came out and helped.